Now that MAS has changed its stance on easing can we have your view on SGD USD and SGD INR. 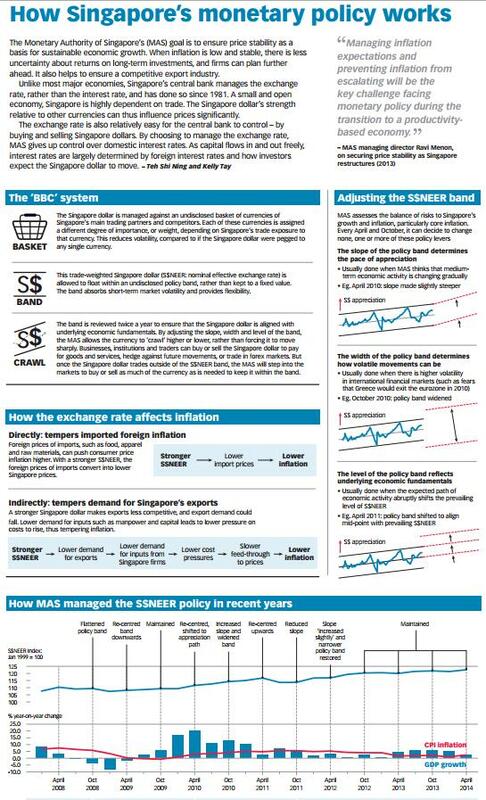 MAS changed its stance on Singapore Dollar appreciation and not Singapore Dollar easing. Previous stand was to have slightly stronger currency than neighbours and now it’s a at par strength. Malaysia and Indonesia are one of the key traditional partners and reliant on oil. With oil prices firming their currencies should get support. I think for now sgd will hover around 1.37 to 1. 39 against the USD. Rupee should weaken to 68 – 69 soon. Maybe state election results or the late monsoons will trigger that… Which would translate to SGD INR hovering around 48. China devalued the Yuan by 1.9%. SGD is getting hit as a result. I agree with most part. However I dont think INR’s overvaluation is going to get fixed anytime soon. The RBI doesn’t really work that way and there are lots of factors to consider for the exchange rate policy and making exports competitive is only 1 of them. The current dynamics around our reducing CAD and record surplus and high inflows will mean that best thing you can expect is only gradual depreciation of the Rupee against USD and against SGD neutral. So 50 or 52 to SGD wont happen. The situation for the INR is going to be a lot better before it is going to become worse. My view is that for atleast another year the INR will remain overvalued until the effects of reducing exports start hurting the economy that is when you might expect bouts of depreciation. But the way the current commodity prices are going, for now until 1 year INR will remain strong atleast against the SGD if not against the USD. I like the Nomura’s prediction, they have got it right. Well that’s precisely the difference between a proactive nation and a reactive nation. As you rightly said there is not just one factor that effects the exchange rate – be it INR or SGD or USD. REER, Inflation, CPI, GDP growth etc in isolation cannot be used to say which way a currency pair is gonna move. Moreover a exchange rate is always relative and not absolute. Most analysts only use the factors which helps justify their view and ignore all others. Our prime minister has a false sense of national pride linked to the strength of the currency and would not let RBI work with autonomy. One should not forget that in Sep/Oct 2013 RBI had to come up with FCNR issue for banks to shore up USD reserves and that money will be due for payment in next 12 months. If the RBI is not allowed to shore up more reserves (read buy USD in open market opertions) than required to cover the Capital Account Inflows (FII investment – hot money) and Outflows that will come due in next few months the country would be setting itself up for another currency shock. It will be interesting to see what MAS does with the SGD NEER slope now in the future. If it keeps SGD appreciating to keep interest rates low, so as to save Singapore property from collapsing then, Singapore’s already slowing growth will take a bigger hit leading to more job losses. If it changes direction for the SGD and starts depreciating it so as to keep growth from collapsing then SIBOR will rise and Singapore’s overleaveraged property holders will get hit. This was the reason Singapore was trying to cool the property space, because it knew that when US interest rates will rise, all the free lunch of appreciating SGD and keeping interest rates low is going to be over. 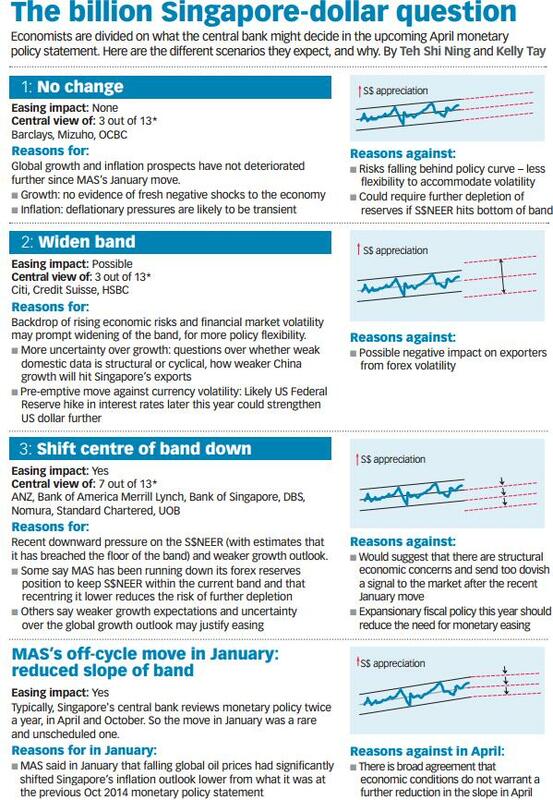 My own take is that MAS will try to keep the SGD neutral and balance it with low growth and moderate interest rates. We just need to see what will be the effects of this low growth on the economy and jobs. It can be seen SGD REER fell sharply from 1998 after the asian financial crisis and kept falling until 2005 and then started rising gradually until 2009. After that a big surge came in after 2009 coinciding with US QE and has peaked in 2014 and now with US interest rates rising this SGD REER is going to reverse. Another interesting thing is the REER chart looks exactly like Singapore property chart there was a peak in 1998 and then bottom in 2003 during SARS and then a new top in 2013. Now property prices inching down, REER should go down which means SGD should fall. REER charts on this site don’t seem to be correct to me. The site shows India’s REER at 103 in June 2015, whereas according to RBI site the REER is 123.5 and that makes the sites REER off by 20%!! MAS does not publish REER data so have to just go by what the site says but before relying on the data it is important to understand how was the REER calculated – what is the composition of the REER basket and also for a comparison the base year has to be the same, but if I were to rely on RBI data the Rupee is 13% overvalued to the Singapore Dollar and should depreciate to 52-53. Now will that actually happen or not that’s something to observe but theoretically that’s where Rupee should be as compared to SGD. My view is that unlike RBI, MAS prepares way in advance and this time around they would increase the interest rates and not just rely on currency rates. That is the reason the Total Debt framework was put in place more than a year back to prepare people for the expected interest rate hike. A moderately weak currency and moderately higher interest rate would help offset any turmoil in the property market. The key for MAS just like any other central banks is to have gradual shifts in market, exchange and interest rates and not a overnight shock – the testament to which is slow decline of property prices over the past 12-18 months. But rupee is gaining momentum for the past 1 week…is there a way SGD going up trend ? 1. The policy deadlock in Indian parliament and sub optimal rain will give FII’s reason to rethink their India strategy. It’s only 3.5 years more for modi govt and the structural reforms expected by General public will start weighing on peoples mind. 3. Fed is widely expected to raise interest rates in Sep which is supposed to be usd positive and should cause INR weakness. I think the interest rate hike is priced in SGD but not in INR. 4. Indian exports are gonna suffer with a relatively strong currency. The Indian rupee is grossly overvalued and should weaken to 70. How soon that will happen is difficult to say. If I were RBI governor or finance minister I will weaken rupee along with falling oil prices. That will ensure that the oil outlay in rupee remains constant but the gains from export increase resulting in nett positive gains for the economy. whats your view on SGD-> INR in August. what’s the best rate expected. I expected it to stay in the 47 – 48 range. I know it’s around 46.5 now but it’s a matter if time for rupee to weaken. whats your view on SGD to INR? I expect it to move back to 48 mark… There should be some more sell off in markets as earnings are not as expected. The key would be USD INR – as it will move to 65 SGD INR will cross 48. What would be May forecast of SGD to INR? It should stay above 47 for May with a bias towards 48, 48.50. SGDto INR currently DBS is giving 47.42. how much can we expert for the near term? That would depend on how long or short is your near term 🙂 but jokes aside I think for the next 2-3 weeks SGD INR should hover around the 47.5 mark. The move from 45 to near 48 has been quite sharp and asks for consolidation. The key here is USD INR movement, if Rupee goes past 64 against USD, SGD INR would cross 48. Hi. The most cost effective way is to do a transaction with someone in India who wants SGD that way both you and the other person saves money. As for online services they are more or less the same. I prefer DBS or money2india and usually compare the rates on any given day before transferring. Always check the interbank or spot rate and never pay the bank or transfer service more than 1% spread on the rates. The markets have a mind of their own… Usually tend to overshoot both upside and downside. You could get a 47.50 in the next week. But I would be happy with anything over 47. Today USDINR again crossed 63 reached 63.25 read one article below, what you say will rupee will go more down. Don’t see rupee going to 64-65/$ as big fall: StanChart Bk According to Ananth Narayan of Standard Chartered Bank, rupee depreciating further to 64-65 per dollar will not be a big move and will help exports. A gentle depreciation should be the base case for the rupee, he adds. Hi, will the sgd reach over 47 by end of April? when will it be possible for sgd to reach 49? Hi Amutha, SGD to INR is already at 46.95 in the spot market as I write. To me it’s as good as 47. If Rupee goes down to 65 then SGD INR would be around 49. Hi Aditya, Today SGDUSD changes from 1.3425 to 1.35145 and also USDINR moved to 62.96 from 63.15 If you check SGDINR impacting 46.85 to 46.62 what you say is it ok to transfer today or this will go more down in this week. Hi Ajeet, money2india is offering 46.42 as of now and I think that is a good rate to convert around half of your target amount. As I always say it’s near impossible to catch the top and predict movements in the short term and transferring in smaller lots is what I always prefer. Ajeet, Use Yes Remit, today’s rate: SGD 1 = 46.15. SGD indeed crossed 46 to the INR, good call Aditya! Thanks Aditya for quick response your previous prediction of SGDINR to reach 46-47 by April saves a lot of my money otherwise i was about to transfer in last month. How this related to SGDINR pair?